Soon we our pigs will be going to the butcher and it will be time for making sausage and ground pork as well as grinding lots of fat for making lard and soap. For years the grinder attachment for my KitchenAid mixer was sufficient for processing the small amounts of food that needed grinding. But it is woefully inefficient for doing big jobs….and not-so-big jobs. Recently when I used it for grinding only four pounds of meat it moaned and became quite warm. This would never do for upcoming tasks. After hours of on-line searching and reading what seemed like hundreds of reviews, I purchased the Weston s-1500 Heavy Duty Grinder for less than I had paid for the KA attachment. One glance at the hopper/grinder parts gives a first look of the quality of each product.The KitchenAid attachment is mostly plastic and comes with two grinding plates. Both come with a sausage stuffer. When using the attachments, the mixer continues to run as well, as well as taking up lots of counter space and being quite loud. I have two different sized KA mixers and when using the attachment there is no discernible difference making one better than the other. The Weston is all metal, and comes with three grinding plates. The motor housing footprint similar to the KA and about half the height, the power cord is stored inside the bottom of the unit, and the noise is no more than that of the KA and the entire weighs much less than the KA. Weston s-1500 dimensions: 6.75” x 12.75” x 14.75” H 8.6 lbs. KitchenAid Mixer dimensions: 4 3/4″ x 13 1/4″ x 16 1/2″ high 25 lbs. The price of the Weston, which included an additional 2 year warranty and free Fed-Ex shipping was $100. Although the KitchenAid attachment costs about $30-$40 you must either already own the mixer or buy one for at least $250 and probably more. Both machines are good, and do the job. When the time comes to put it to the test in a few weeks I will re-visit this review. Soon our bare-root trees will be delivered and we will be busy planting a test orchard, and several flowering trees and bushes. The orchard will have apples and peaches, and cherries. We will also be planting forsythia and lilacs, one red maple and ten flowering trees. I ordered the trees from the Arbor Day foundation who provide a list of the best trees to plant according to your zip code/growing zone and don’t ship until the best time of year for your zone. Our best planting time is late Oct-early Nov.
With membership come discount prices, and free trees, free shipping and guarantee to grow. This week will be when we beginning preparing for the plantings by deciding where each tree will be planted, and where we plant the orchard. I have two sites selected where I think the orchard will thrive. The orchard: 2 Montmorency Cherry trees, 2 Belle of Georgia Peach trees, 3 Red Jonathan apples, 2 Early Harvest apples, and 1 Lodi apple. The apple trees are all semi-dwarf. This new start on the farm is very welcomed following a very frustrating year. 2018 has been difficult on the homestead. Predators, mostly neighboring hunting dogs, have decimated our flock of chickens, again. In total they have killed nearly 100 of our chickens despite our attempts at fortifing their run. The last time they attacked, they had to tear through three fences to get to the chickens. 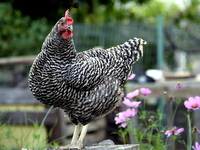 I am planning to buy solar powered fencing for next year’s flock of Bresse chickens. The meat chickens will live in chicken tractors where they will get to feed on all the bugs, which reduces the need for feed, while they fertilizing the fields. Along with solar powered electric fencing we will also include geese in the flock to help protect them from predators. Last year, 2017, we sold the goat herd which reduced our work load and costs. We also re-homed the dogs to the same farm this year. It was painful to see them go, but without the goats or chickens there was no reason to keep them. They are quite happy at their new home with their goats. The only livestock remaining are the pigs, and they are currently staying at a neighbors farm. They kept breaking out of their pen, and running straight through their electric fence. A few weeks ago they escaped for the fourth time and our neighbor suggested they stay at his farm where they could not break out, until next month when it will be time for them to go to the butcher. We did sacrifice one of the pigs during their last excursion because it refused to get into the trailer with the other three. We will be sending those three to the butcher at the end of November. This was our first time raising pigs and it has definitely been a learning experience. We have decided to fence a wooded area for next year’s pigs, instead of a penned yard. We have approximately 17 acres of trees which will provide lots of foraging opportunity, as well as adjoining pasture where they can feed. So, these days it is rather lonely at the farm when not even the buzzards are around looking for prey, but hopefully the emptiness won’t last much longer. Making Lard for the First Time – So Easy! Our pigs were/are escape artist breaking out of their pen and ignoring the electric wire they ran off four times. The first time they were missing only one night. The second time, four days. On their third excursion they were missing for two weeks before finding their way home…. by that time we had given up hope on seeing them again. There last escape was two weeks ago, they remained nearby, rooting up a neighbor’s yard and foraging in the wooded areas close-by. We could see them, and although we tried to tempt them to follow us homeward, they would not follow us all the way home. After getting help from neighbors and friends, they were rounded up and loaded into a trailer, unfortunately for most stubborn, only three survived. The fourth stood his ground, refusing to go into the trailer and was put down. It had been several hours by the time Nick, who’d had his fill of chasing the animals, made the decision. We gave the meat to those who had helped us, keeping only the leaf fat and sirloin for ourselves. I had been waiting for the day when I could render lard from the leaf fat of our own hog for years and yesterday I finally had the much-anticipated opportunity. Because the pig was still only half-way to optimum butchering weight there was barely 2 pounds of leaf fat which I cut into 1 inch cubes then ground and melted over a low heat. strained fat into sterile pint jars. As it cooled on the counter it became pure white and actually had the appearance and feel of Crisco with absolutely no scent. The other three hogs are spending their remaining months at our friend’s farm where they won’t be able to escape. I may be more excited about getting more fat from them, than I am about getting their meat. I plan to use their other fat to make soap…. which will also be a first for me. Author KathleenPosted on October 18, 2018 October 18, 2018 2 Comments on Making Lard for the First Time – So Easy! It’s very simple, although it takes 5-7 days to develop. But it’s well worth the wait when you get your first taste of this wonderfully flavored home-baked sour dough bread. All you need is flour, water and a covered container that holds at least one quart. Combine ingredients in a non-reactive container about 1 quart. Mix well incorporating all the flour. Cover leave at room temperature for 24 hours. and 1/2 cup cool water (if your house is warm); or lukewarm water (if it’s cold). room temperature for 24 hours. You should begin to see a difference in the “dough”. It will be lighter. Today you’ll likely see some activity — bubbling; a fresh, fruity aroma, and some evidence of expansion. generous half cup . Discard any remaining starter. Add a scant 1 cup (4 ounces) All-Purpose Flour, and 1/2 cup water to the 4 ounces starter. Mix the starter, flour, and water, cover, and let the mixture rest at room temperature for approximately 12 hours before repeating. Day 4: Weigh out 4 ounces starter, and discard any remaining starter. Repeat day 3. Day 5: Weigh out 4 ounces starter, and discard any remaining starter. Repeat day 4. By the end of day 5, the starter should have at least doubled in volume. You’ll see lots of bubbles and the starter should have a tangy aroma — pleasing but not overpowering. If your starter hasn’t risen much and isn’t showing lots of bubbles, repeat discarding and feeding every 12 hours for as many dats as necessary — as long as it takes to create a vigorous starter. It should be bubbly and doubled in volumn. Once the starter is ready, give it one last feeding. Discard all but 4 ounces (a generous 1/2 cup). Feed as usual. Let the starter rest at room temperature for 6 to 8 hours; it should be active, with bubbles breaking the surface. Remove however much starter you need for your recipe — typically no more than 8 ounces, about 1 cup. If your recipe calls for more than 1 cup of starter, give it a couple of feedings without discarding, until you’ve made enough for your recipe plus 4 ounces to keep and feed again. Transfer the remaining 4 ounces of starter to its permanent home: a crock, jar, or whatever you’d like to store it in long-term. Feed this reserved starter with 1 cup of flour and 1/2 cup water, and let it rest at room temperature for several hours, to get going, before covering it. If you’re storing starter in a screw-top jar, screw the top on loosely rather than airtight. Store starter in the refrigerator, and feed it regularly as we’ve been doing once a week. You can dry out your starter and use it later when you have more time for it. This would come in handy for times such as going away on vacation or moving. I haven’t tried drying it yet, but it seems like it may be a good way to store the “discard” rather than throwing it all away. There are a few You-Tube videos on drying the starter. I will be using this recipe from NutmegNanny to make my no-yeast added sourdough bread. Day 7: Today I am assembling my bread dough which may need to rise overnight in the fridge. I plan to make two loaves, one using only starter, the other adding a small amount of yeast. Day 8: Baking day! So good. Although I really cannot take credit for this dish, I do want to share it with as it is incredible! I did adapt her recipe a bit however by using 1 Cup Parmesan, 3/4 Cup Asiago and 1/4 Cup Mild Cheddar cheeses. Also, I added a pinch of red pepper flakes and about a tablespoon of chopped parsley. This easy Alfredo sauce calls for just a handful of ingredients and comes together in about 5 minutes. Toss fettucine in this sauce or drizzle over chicken. 1. Add the cream and butter to a sauce pan over medium heat and bring to a simmer. 2. Whisk in the garlic and simmer for 30 seconds. 3. Turn off the heat and whisk in the Parmesan cheese, salt, and pepper. 4. Continue whisking until cheese has fully melted and sauce is smooth and creamy. These days it seems that memories which had been long stored away in the files of my mind have been making their way to the present with flashes so clear they could have been created yesterday. The latest brings me back to a time when I was barely taller than the hem of my mother’s blue taffeta skirt. Considering my mother never measured more than five feet two inches tall, and the hemlines at that time were mid-calf you can assume my age was most likely tallied in months rather than years. all sat to be photographed by my uncle. He was an amateur photography and thanks to him and the dark-room he created in the bathroom we were blessed with a great many photographs and portraits of our early years. Mom’s dress was a blue moire with a full skirt beneath which she wore petticoats which made the skirt move and swish as she walked. That swish fascinated me along with the watery appearance of the fabric. One of those simple things that made up my special memories of my mom. She was only twenty-seven years of age, and even now when I see the tiny white-haired woman of 93, I still see her as she was back then…. young, vibrant, and beautiful. What happens to the food in the freezer when the power goes out? It thaws and you either eat it or throw it out, right? Nope, pressure canning meat not only saves that possible loss, but it also provides safely preserved, good tasting meat for quick, meals. I dry can ground beef which will be used later in any recipes that call for loose, browned ground beef such as meat sauce, tacos, etc. One pound of ground beef fills a one pint jar. Brown the meat, drain off the liquid, and loosely fill sterile jars removing air pockets as usual. Tapping the jar on the counter will help settle the meat into the jar without tamping. (the little bit of fat in the jars is harmless and was forced from the meat during the pressure canning process). These jars each contain one pound of beef which fill the jars to the bottom ridge and became packed down during processing. Wipe the jar rim with a cloth dipped in vinegar, add lids and rims, and process for your altitude; 75 min, 11 lbs for pints or 90 min 11 lbs for quarts at elevation below 1000 ft according to the USDA directions for beef. This Canning Times is what I use.